It might be said that using a needle is in the genes of the Lady-of-the-House. Her great-grandmother, Helen, (born in the 19th century) was a widow with children by the early 20th century. She never remarried. 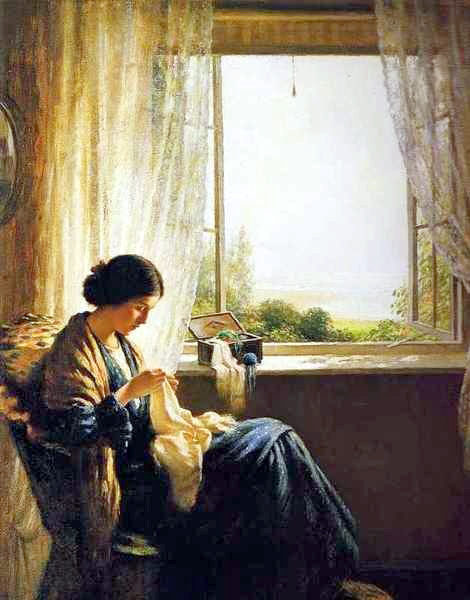 To care for her family she worked as a seamstress. 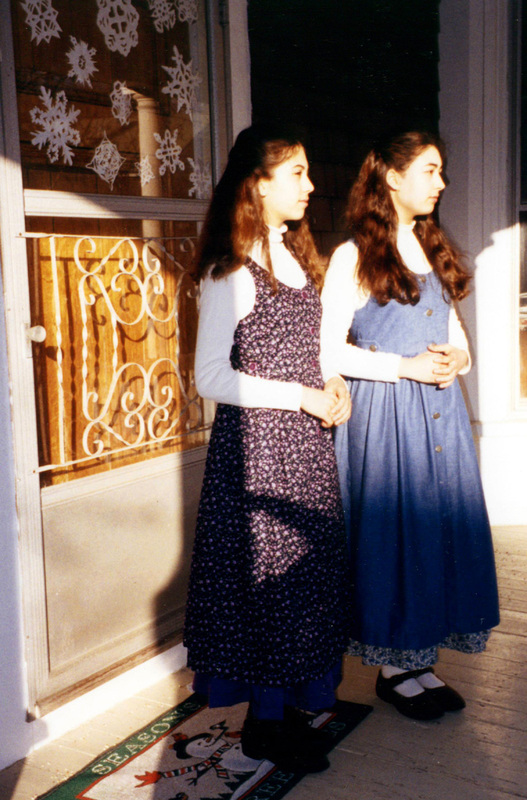 Custom dresses and alterations kept her household in milk and bread. And coal was needed in winter. In her leisure Helen crocheted lace. 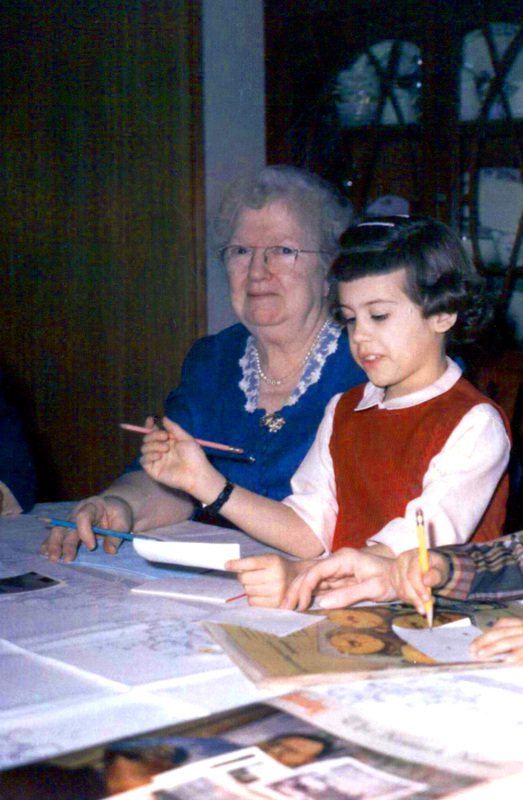 This photograph taken in 1966 shows the Lady-of-the-House, sitting happily with her "Nana" Helen. (Oh my, how short bangs were cut on little girls then). Following household chores and writing, the Lady-of-the-House picks up a needle. An easy chair is strategically placed where the window-light is at its best for stitching. 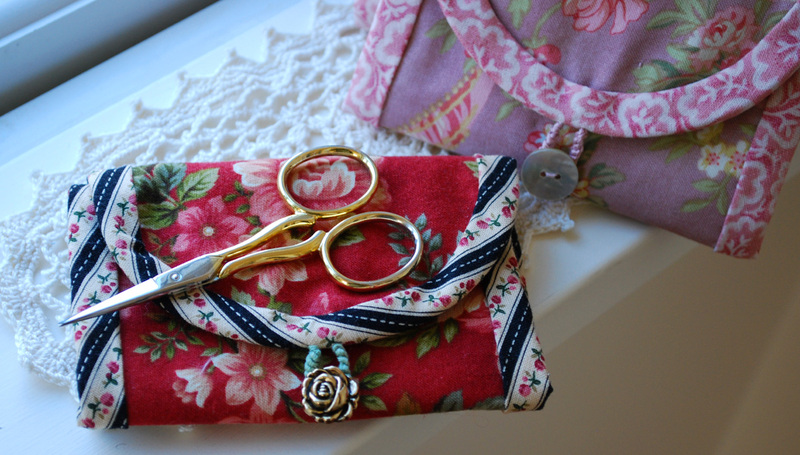 In the dark of the night, after closing a book, when she lays her head on the pillow the Lady-of-the-House unconsciously lets her mind drift onto the next handmade item she would like to make. It's soothing to imagine what you'd like to do. Dreaming up a likable list that welcomes creativity is a way to de-stress. It is as soporific as counting sheep. Last summer she saw some of her likable list realized. Purchasing what is known in the quilting world as "fat-forths" she assembled fabric for making needle books that roll up and fasten. 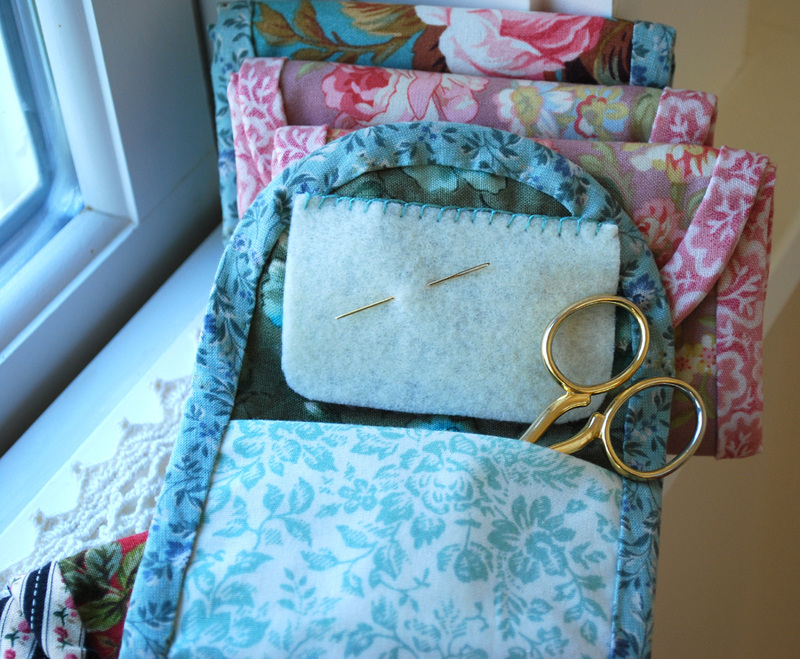 These needle books are portable pockets to store little scissors, embroidery needles, safety pins, cable-needles for the knitter, and the sticky-sided thimble dots - that the Lady-of-the-House goes through by the dozens while sampler-stitching. "And for my part, I was all in a fright for fear your sister [in-law] should ask for the huswifes she had gave us a day or two before, but however, nothing was said about them, and I took care to keep mine out of sight." 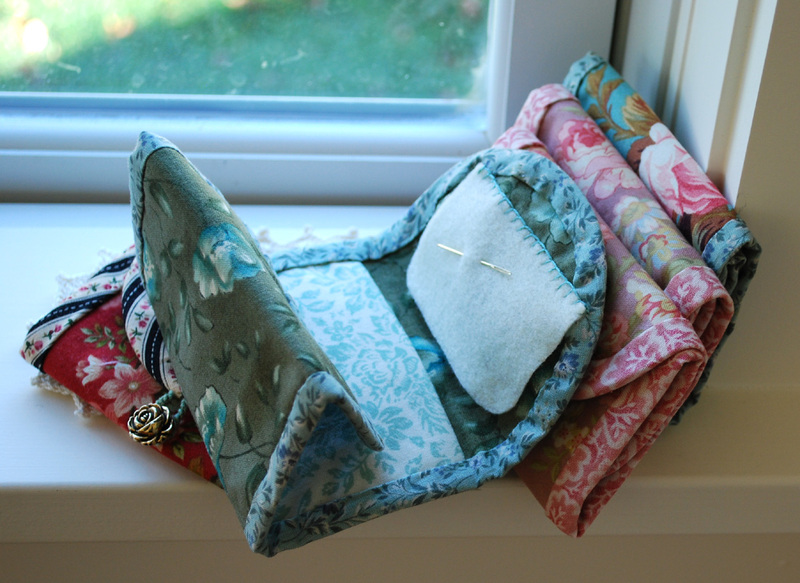 The Lady-of-the-House enjoys making things in batches and in an array colors. When given a choice, her married daughters each chose a red huswife. A dainty huswife can be slipped into a skirt pocket. This is where Miss Austen's Emma kept hers. Balancing on the arm of an easy chair is where the Lady-of-the-House keeps her green huswife in readiness. A friend crafted the Lady-of-House a bird atop a brass candle stick - an unsuspecting place to safely store needles to never be at-a-lose for one. It is treasured by the Lady-of-the-House. Needles are kept under the felt-lined wings of the bird that the Lady-of-the-House says is an Indigo Bunting (Passerina cyanea) after excitedly spotting one last spring (for the first time). Through the kitchen window, the Man-of-the-House captured this secretive male bird on camera. 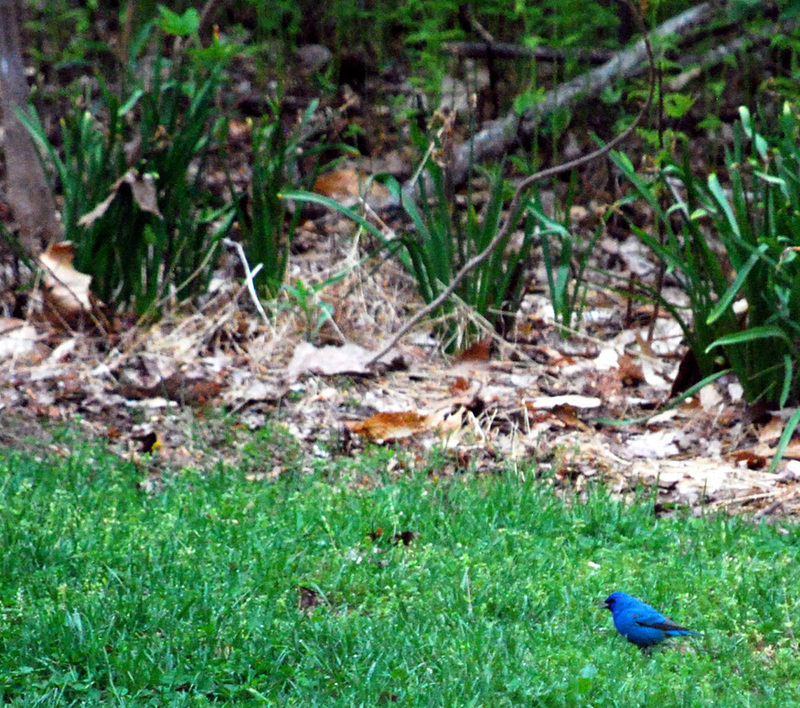 His wife will be on the look-out for a another Indigo Bunting at the woods' edge this spring. The brown-feathered female Buntings blend with the browns of the woods and will not be lured by any means to venture outside it. This week, the snow has melted off the roof. Hearing a few birds' melodies at dawn is a welcome sound. The tiny felt strawberry, dangling from the beak of the Indigo Bunting is practical. Here a mending needle can be sharpened. This tiny practical-embellishment took many tries before it was finished to satisfaction, it was admitted to the Lady-of-the-House, who understands because she also must rip out stitches and start again, in spite of the inherited genes from great-grandma Nana Helen. 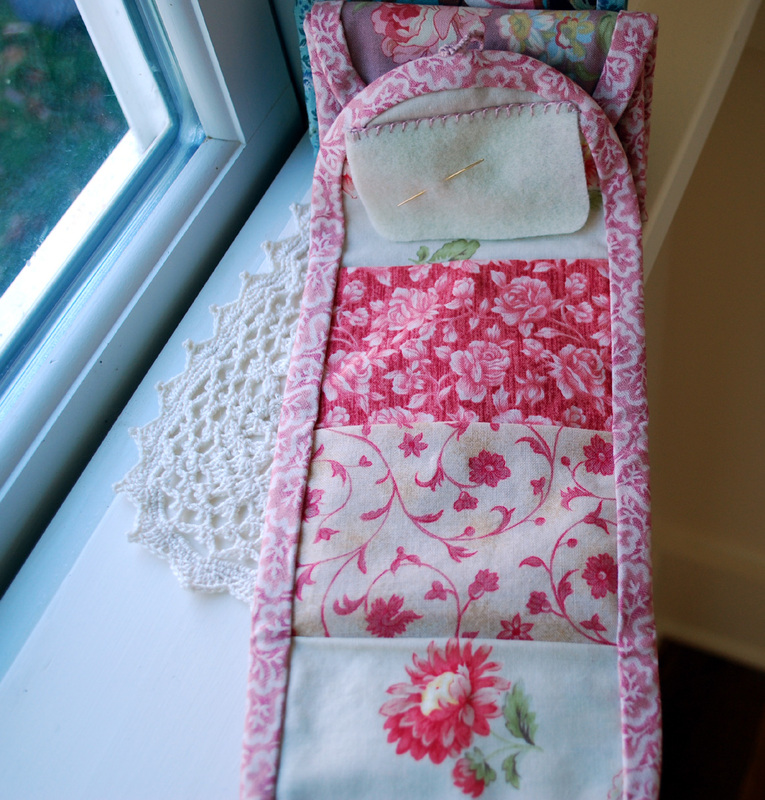 To see an earlier post on this blog with Nana's beautifully crocheted clothes hangers, click here. If you can't abide a traditional thimble while hand-stitching you might like the Thimble Dots. Because the Lady-of-the-House has a nickel allergy she is very appreciative for the Gold Tapestry Needles by John James. Brittany Birch Cable Needles are a favorite. Available in a pack of three.